During World War Two, the opposing sides were constantly competing against each other to keep abreast of the latest technological developments and, as a result, it led to ever more powerful and effective warplanes. In 1941, the new German Fw 190 fighter began to enter service and in response the British hastily developed the new Spitfire versions along with introduction into service of a new type called the Hawker Typhoon Mk.I. The introduction of the Typhoon and its powerplant into service was not without troubles and as restrictions of the Typhoon design soon emerged, Sydney Camm, Hawker´s chief designer, began to design a new fighter aircraft, partially based on the Typhoon. 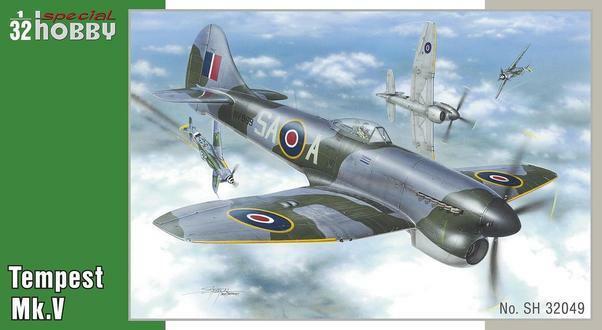 As the number of alterations to the original design was quite substantial, the new plane was to carry a new name, the Hawker Tempest and soon proved to be one of the best WW2 fighter planes. The 1/32 scale model of this iconic fighter plane was first issued in so called Hi-tech boxing which is sold out these days and now we would like to offer the modeller a basic version of the kit, which means it doesn´t contain the extra bonuses of resin (PUR) and photo-etched parts. The plastic parts come via as many as eight sprues of grey styrene and one clear plastic sprue and the surface throughout benefits from neatly engraved panel lines and rivet details. During the build, the modeller is guided by a highly detailed A4-size full colour instruction booklet. The decal sheets (there are three of them) and the camouflage option schemes offer in total four different machines. The Camouflage A represents NV969 / SA-A machine flown by Sqn.Ldr. Warren „Smokey“ Schrader, DFC and Bar (out of his total 12 kills he achieved 9 and ½ in the Tempest). Camo B offers JN862/JF-Z adorned with invasion ID stripes and it was a usual mount of F/Lt. Remy van Lierde, DFC and Bar, a Belgian in RAF service with 44 victories over V-1 missiles. The third camouflage option is EJ705/W2-X with a smart kangaroo artwork on the fuselage side and was flown by Australian Plt. Off. F.A. Lang . The camouflage scheme option D brings the modeller SN165/ZD-V machine, in which cockpit its pilot Sqn. Ldr. Emanuel Barnett Lyons, DFC experienced a rather arduous story with a fortunate ending. The decal sheets cater also for a complete set of stencils, including also items for the cockpit and the external fuel tanks.